The New Year is a time for looking forward, but in the past few days several things have also prompted me to take a backwards glance. One of these things was the summary of the previous year’s statistics for my blog which Word-press compile each year. Two features intrigued me. First, was the very wide geographic range of the readership. But even more intriguing was the fact that three of the most viewed pages in 2014 had been posted in 2010 or earlier. It led me to wonder just how much my views on the topics of those posts have changed in the past five years. The most frequently viewed post was one of my 2010 posts on HRV. At that time I was intrigued by the possibility that regular HRV measurement might be an effective way to guide the adjustment of training load. In the preceding years, several studies by Kiviniemi and colleagues from Finland had provided preliminary evidence indicating that daily measurement of HRV was potentially useful for adjusting training load. In particular, a decrease in high frequency HRV was reported to be a useful indicator of the need for recovery. Although several recent studies have confirmed that HRV is related to the effects of training, there are inconsistencies in the findings, and I am not yet convinced that these studies provide compelling evidence that daily measurement provides a reliable basis for day-by-day adjustment of training load. Indeed a recent study by Plews and colleagues reports that daily HRV measurement is only weakly related to training status, though a weekly average was a quite strong predictor of 10K performance. My own experience is that HRV, measured either at rest or immediately after exercise is not sufficiently consistent to provide a useful guide to adjusting training on a day to day basis. Nonetheless, I do regard a marked reduction in resting high frequency HRV as a pointer towards the need for better recovery when it occurs in association with other signs of stress. Conversely, unusually large amplitude HRV while running appears to be a fairly reliable sign of stress (as illustrated in figure 3a from my post in 2010). 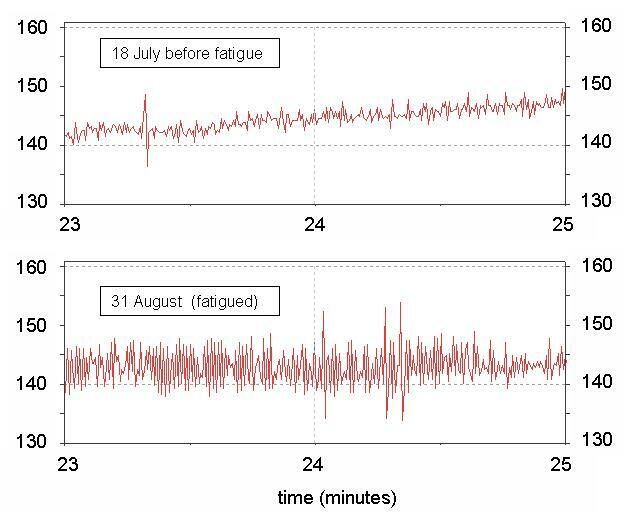 However, the main reason I continue to record R-R traces during training runs is to monitor the frequency of occurrence of rogue rhythms – a common but inadequately understood phenomenon in elderly runners. The second most frequently viewed post in 2014 was my 2010 discussion of the Dr Romanov’s Pose method of running. That post had drawn many comments at the time of the original posting and has attracted many thousands of views since 2010. Although I started the post with a list of the positive features of Pose, the main message was that Dr Romanov had seriously under-estimated ground reaction force (GRF) during running and as a result had drawn the erroneous conclusion that the net force acting on the runner’s body after mid-stance is directed forward and downwards. This led him to the erroneous conclusion that the centre of gravity falls after mid-stance. 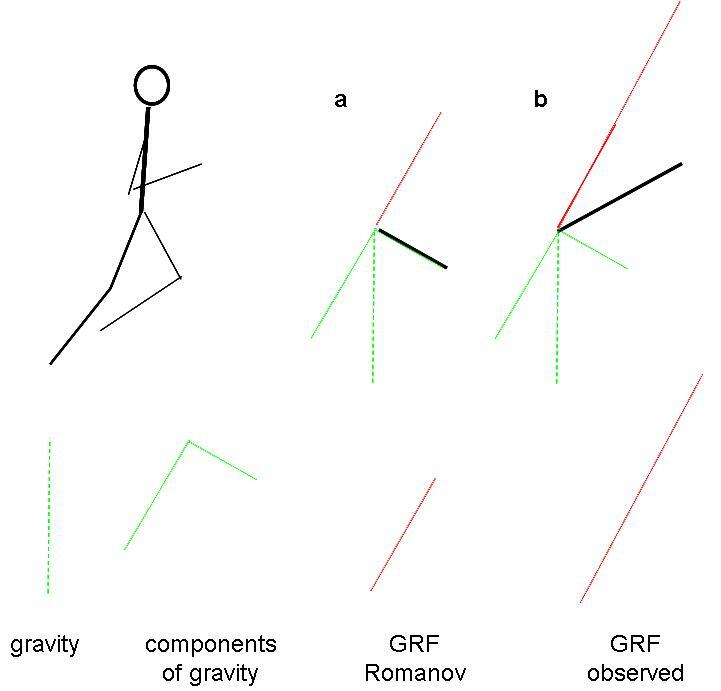 In contrast, a realistic estimate of GRF indicates that the net force after mid-stance is directed forwards and upwards. Dr Romanov’s mantra of ‘pose, fall, pull’ does not correspond to what happens. As a result, Dr Romanov seriously underestimates the crucial role of a well-timed push upwards and forwards off stance. Five years later, I still regard this as the cardinal flaw of the Pose technique. The fact that my post continues to be widely read five years later indicates that the running community is still curious about Pose, but as far as I aware, serious discussion about running technique is now more focussed on how to achieve a well- timed and directed push after mid-stance. My own opinion is that the most effective strategy is to rely on the cue provided by a brisk downward swing of the arm contralateral to the leg on stance. Forces acting on a runner after mid-stance. I still adhere to the main principles that I advocated in that post, though my opinion about optimum paces has changed over the past 5 years. As discussed in my recent post on the virtues of high intensity v high volume training I now favour a somewhat more polarised approach during base-building (and also during race specific preparation) than either Lydiard or Maffetone would have recommended. I think that it is more constructive to replace some of the ½ effort and ¾ effort runs recommended by Lydiard with short high intensity sessions, as I consider that the cost/ benefit ratio of high intensity sessions is greater than that of upper aerobic sessions. However I do not regard this issue as settled beyond doubt. Of all the comments I have received on my blog over the years, the one that most tickled my fancy was Eternal Fury’s remark a few years ago that my blog is a candy shop for running nerds. I assume that the candy to which EF referred was the detailed technical examination of the physics and physiology of running. Indeed I do enjoy looking into the biomechanics and physiology of running. I believe that the best foundation for making sensible decisions about training and racing is a synthesis of practical observation of what works for others and one’s own experiences, interpreted in the light of what we know about how the body works. So I hope that the candy is both interesting entertainment for running nerds and informative for runners who simply aim to run as ‘fast and injury free’ as possible. In fact I agree strongly with Laurent. Running is largely innate and therefore we should largely trust our body to run in the manner that comes naturally. However, many runners suffer injury, and when this happens repeatedly we need to ask why. So is it possible to distil the science of running into a few clear principles? The short answer is no. Running involves every system of the body, ranging from the brain (and mind) to the toes, so it would be fat too simplistic to try to condense the essentials into a few principles. However, when I started this blog, one of my main pre-occupations was how to run ‘injury free’. I believe that it is possible to distil the science of running injury free into a small number of basic principles – though as Einstein once remarked, we should seek explanations that are as simple as possible, but no more simple. So here is my response to Steven in which I have tried to distil the science of running injury free, in a manner that is as simple as possible but not too simple. In the past decade I think there has been an over-emphasis on faults of style as the major cause of injury. I believe that subjecting the body to greater stress than it can cope with is the major causal factor in in many instances. Therefore one of the main strategies for avoiding injury is building up training load gradually, and at all times recognising when the body is near the limit of coping. This is not easy, though a variety of signs covering both overall well-being (mood; heart rate variables) and focal signs such as accumulating aches in connective tissues or local muscle spasm provide useful clues. However, in some instances faulty technique plays a role. But there is a great deal of misleading information in circulation, due to over-simplistic analysis. The human body is very complex. Nonetheless, it does obey several well established principles, based on both Newtonian mechanics, and the principles governing the behaviour of biological tissues. The first things to consider are the laws of Newtonian mechanics. We need to meet two goals: minimising energy expenditure and minimising stress on body tissues. Minimising energy expenditure requires the optimum adjustment of the three major energy costs: getting airborne; overcoming braking and the cyclical repositioning the limbs relative to the torso. Simplistic focus on just one of these leads to over-emphasis on a single requirement. For example, we can minimise the cost of getting airborne by reducing vertical oscillation, but that inevitably increases the cost of overcoming braking, at a given cadence. We can minimise both braking costs and cost of getting airborne by increasing cadence, but that increases limb positioning costs. Conversely, if cadence is too slow there is a strong temptation to increase stride length by reaching out with the swinging leg, thereby incurring braking costs that are inefficient and potentially damaging. The need to balance the three main costs leads to 2 important conclusions: first, simplistic rules such as avoid vertical oscillation without considering other costs are misleading and potentially dangerous. In general, it is best to let the non-conscious brain do the calculation required to optimise the three energy costs, because the brain is usually very good at finding the most efficient solution. However, as discussed in most post on running cadence, there appears to be one exception: most recreational runners select a cadence which appears to be slower than optimal for fast running. Maybe this is because we are naturally adapted for slow running over rough terrain where maintaining balance is a high priority; alternatively it might be that a sedentary lifestyle encourages our brains to be too cautious. So if there is one simple issue we should address consciously, it is making sure that cadence is not too slow (eg at least 180 steps/minute at 4 m/sec). Associated with the large forces required to get airborne is the fact that the geometry of our hips knees and ankles results in quite large rotational effects around two, or sometimes all three axes, at these joints. Some of these effects are not easily envisaged, so there are certain injuries that do require a careful biomechanical analysis. Nonetheless I consider that gradual build-up of training load and trusting your non-conscious brain is the most effective way of minimising the risk of such problems. If you do decide that you need to adjust style consciously, it is safest to focus on a compact, brisk but relaxed arm action. This tends to promote a compact efficient leg action as a consequence of the way the brain codes movement. Overall, the science of running is complex. Some problems are indeed more challenging than applying quantum mechanics to calculate the energy levels of an electron trapped in an infinitely deep well, but a few simple principles provide most of the guidance a runner needs to maximise the chance of running injury-free. This entry was posted on January 5, 2015 at 1:32 am and is filed under Physiology, Running Mechanics, Training. You can follow any responses to this entry through the RSS 2.0 feed. You can leave a response, or trackback from your own site. Those were good posts Canute. I’m just happy that the science behind running is, for the most part, easier to understand than the theory of entering and returning from a worm hole as portrayed in the film Interstellar. Although I’d agree that running is mostly innate, I also think that an individual’s running form (style?) can be moulded (improved) in the same way that good swimming form can be coached. Unfortunately with running, the “payoff” is not so immediately measurable. Yes, even though the development of a body structure that facilitates efficient running is innate, we do still have to learn to implement the procedure by practice. In general non-conscious brain activity can achieve this without the need for conscious micro-management. The major features are learned in the first year or two of life, but the action is refined to achieve optimum efficiency and safety.by subsequent years of practice. As described in my post on efficiency a few weeks ago, optimum mechanical efficiency requires fine tuning of cadence and of both the timing and magnitude of push so as to minimise the total energy cost. This requires years of practice and also the development of the required muscle power. As Paula Radcliffe illustrates, efficiency can improve over a decade or more. However for the most part we should let the non-conscious brain learn the optimum timing and magnitude of the push. It is useful to consciously check on cadence, and at least for women (and probably for elderly men) it is useful to make a deliberate effort to increase strength. Furthermore, if we suffer repeated injury we need to look at how we are achieving the forceful push.